There is one more thing I’ve started for 2014 that I forgot to mention in my last post. 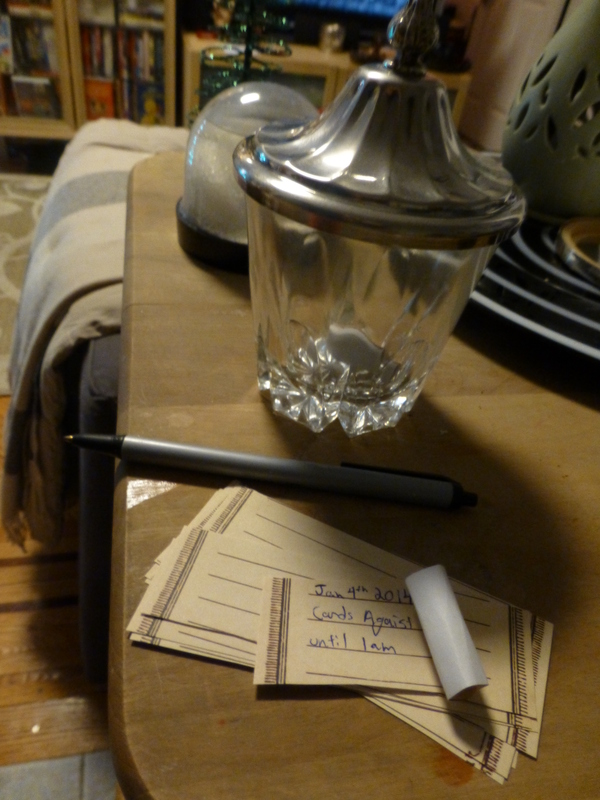 I’ve started a memory jar for the year. The idea is one that plays well with my resolution of mindfulness. Often, when I try to remember a year nearly all of the details get lost. If you’re lucky you can glimpse that amazing moment on the beach battling the waves with your three year old niece or the snow falling against the colors of the sunset on top of the best sledding hill in Michigan. But most likely all the small and beautiful moments that make up what life really is get lost. Sure, pictures help, but as the years pass they end up just differentiating which was the year you went to Hershey vs. the Poconos. Several years ago I started a two sentence journal where I write a couple sentences at the end of every day to help remember my daily life. It’s been a helpful way to see the patterns and changes of my life especially since I don’t keep up my actual diary/journal very well. But this is something different– this memory jar (which is currently an antique sugar bowl that was in the back of the cupboard), holds moments of happiness and joy and peace and love and friendship that slip away from long term memories. On December 31, 2014 I’ll take them all out and read like fortune cookies, all of the best moments of my year. And just like that the clean slate and starry eyed feelings of the holidays are gone. It’s true, we are more than half way through January — already we’ve battled a polar vortex and been thrust back into the daily slog of real life. Already the crowds are thinning out at the gym and the guilt of missed resolutions is settling in as opting for another night on the couch instead of writing or running seems so much more appealing. And as much as I like to reflect and plan in early January, perhaps these first few weeks of the month shouldn’t be such a sharp contrast to the weeks before — it’s a lot to ask to go from eating, drinking, making merry and relaxing to punishing yourself to be some ideal version of yourself. 1. Introducing the first annual Davis-Beazley Family Yearbook. In addition to my highlight reel from my last post, I also created and ordered a “yearbook.” I used to print my pictures every few months and put them in photo albums, but that has slowly died off as I share more photos online and take more pictures. It just seems too daunting and repetitive and takes up too much space to keep up. Besides I almost never look at those albums. But for the same reasons that I love the year-end recap articles, looking at a collection of all of the highlights from each year will be one consolidated place to spark the memories of the year. What is there to grieve about 2013? After those questions you write one final sentence about the year to declare it complete, all of the good and bad. Answering the same set of questions each year puts a lot into perspective. First, it shows me how much I’ve accomplished: it’s easy to get that down on yourself guilty feeling that my whole life consists of work, commute, chores and collapsing on the couch. Then I force myself to see that I’ve actually done a lot. The next set of questions shows me how year after year I face the same fears and disappointments. Inspired by this article that I edited in December at Fast Company, I decided to write a letter to myself on 12/31/14, recapping everything that’s happened in 2014. I doubt that I’ll accomplish all the I claim in the letter, but just the act of wording it as things that have happened gave me the thrill of joy and hope that a long list of personal improvement to-dos doesn’t. Instead I painted a picture of the kind of future I’d like to have. Big things are going to happen this year, and I don’t want to miss them. I plan to pay attention to the minutes and hours of my life.